Mini pies. Red currants & almond cream. Two bites of sweetness and less guilt. Or take two or three pies and just own it already! I choose the last option. Let me tell you that this perfect buttery crust filled with these little sour red currants and an almond filling is just the balance of taste you need in life. Few reasons for a small batch. So cute to state the obvious: it is just too adorable. It presents very well on a table of desserts or it’s an attractive addition to a potluck with friends. Practical baking: I’ve used this technique before for my vegan chocolate tartelettes, I bake my pies in a mason jar lid. Just tuck some aluminium foil and place your crust and voilà. Quite easy to take of the mold too since the mason jar lids are in 2 parts. Very convincing: not that you’ll need to shove it down someone throat but if you or the person you are offering it to is trying to watch their waist, this would be the bite to be weak on! Most of my recipes on my blog are in grams. I strongly believe in using a scale while baking. Please please do consider it when making any dessert, it will be way more accurate and therefore way more chance for your recipe to turn out the way you wanted. Because I do it so often, I can make one in 5 minutes. No joke! Even if my butter isn’t soft. I had made a short post here to encourage you to make you own pie crust. Let me know if you do! Side note. Lack of inspiration? Where have I been? Keeping up with the blog is always – like all the time – all day, in the corner of my mind. I have so many ideas, so many recipes I want to try and improve. Make healthier version, share my daily hacks that work for me. I am not Superwomen (although my son thinks so! * heart melts *) and being a mom of 2, having a full-time job, driving around to activities, keeping up with the house chores is taking all my energy. I will figure out a way to be more present here because I really enjoy it. So not a lack of inspiration but rather lack of time. I am trying to keep a presence on Instagram so you guys know I’m still here! Come and follow me. I haven’t really jump in the Insta stories bandwagon, shall I? - Mix the butter, the flour and salt together until it is crumbly. - Add the milk at once and mix gently to form a bowl of dough. - Don’t over-work it, just enough so all the crumbs are all picked up. You are done! It is ready to be rolled! -In a bowl, mix the eggs, butter, sugar and almond powder. 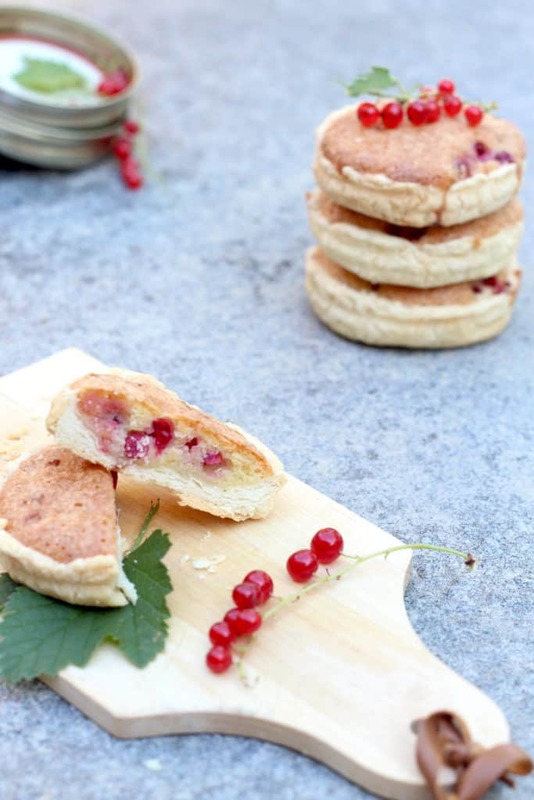 - In the mason jar lids, where you have spread the crust, place a few red currants in each mini pie. - Pour some of the almond filling in each - probably the equivalent of 2 tablespoons - give or take. Bake at 300F for 15 minutes or until the crust and the top is golden. I ALWAYS use my scale to bake - I have added the equivalence for your convenience but I can't recommend enough to bake with a scale for accuracy. 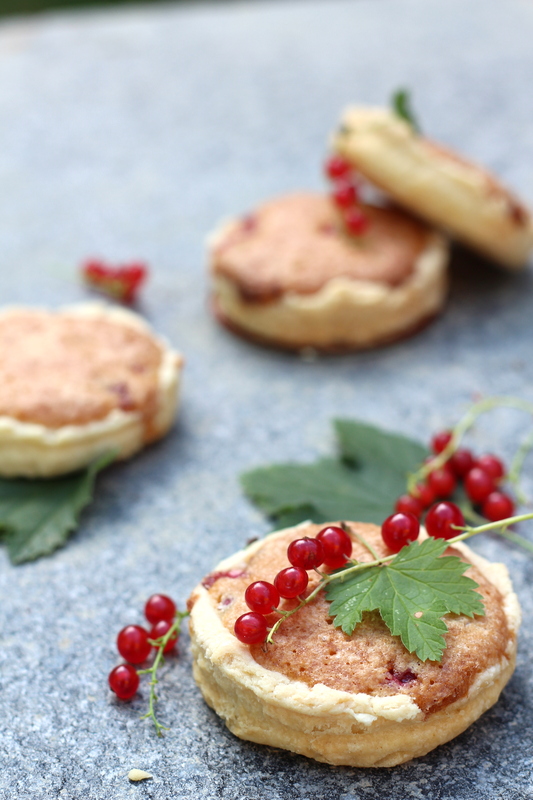 I love red currant and these little pies look delightful. Especially that you used mason jar lids. What a great idea! I’ve never heard of almond cream, but I’m definitely intrigued by a non-dairy topping. These are so cute! I bet they’re tasty too. These tarts are so sweet, Melanie! 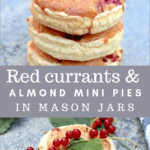 It is such a wonderful idea to use the mason jar lids – they are the perfect size for a mini tart. 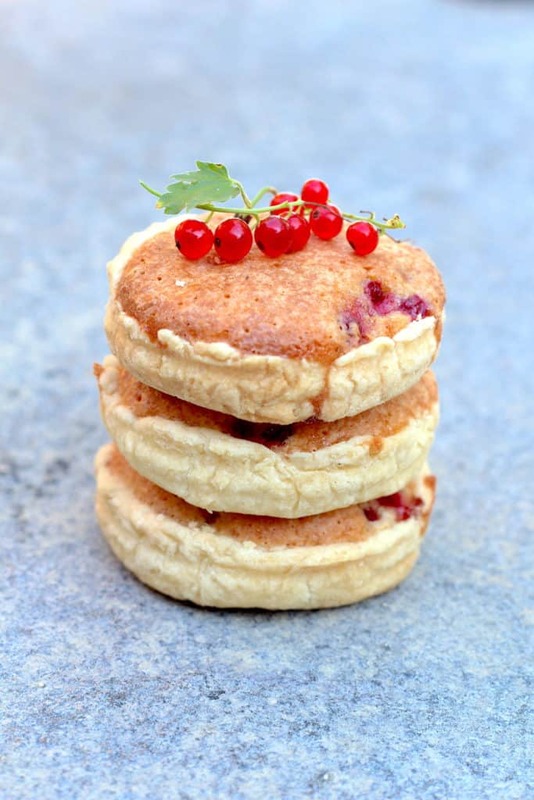 I am quite fond of almond frangipane type of fillings – now to find red currants! Thanks for sharing such a lovely tart recipe.